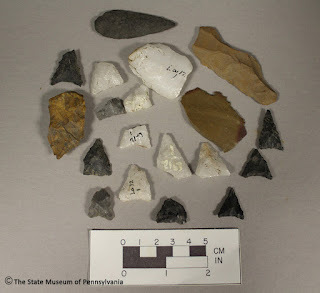 Our TWIPA (This Week in Pennsylvania Archaeology) blog often highlights significant artifacts curated in our collections at The State Museum, usually an interesting historic ceramic or prehistoric stone tool. Archaeology though, is a study of all material culture and this week’s blog will draw attention to an often overlooked asset to our Archaeological collections, our research library. The Section of Archaeology is proud to care for a small annex of the Pennsylvania Historical & Museum Commission library pertaining specifically to published Anthropological and Archaeological materials. This serves as an invaluable resource for both researchers and staff, providing current information in the form of scientific journals and the cumulative information of a collection of books spanning several hundred years of human thought and knowledge. We frequently overlook the books that are part of our collection for the seemingly more interesting artifacts discussed in former blog posts, but in truth there are some amazing specimens in our library. A recent project has provided the opportunity to sort through some of our rare books in an effort to house and support the older and frailer books of our collection. As you can see, individual boxes are being constructed to the exact size of the book, allowing them to be completely supported horizontally. The boxes are custom constructed with semi-open ends to allow the books to ‘breathe’; and these are kept in our climate controlled library. Over the course of this project we have come across some truly rare gems. 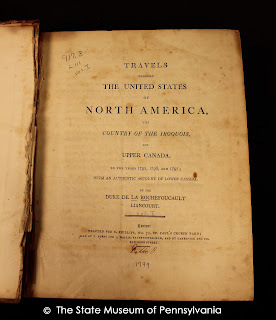 One such gem is a book titled Travels Through the United States of North America the Country of the Iroquois and Canada in the Years 1795, 1796, and 1797 With an Authentic Account of Lower Canada written by the Duke De La Rochefoucault Liancourt, published in 1799. 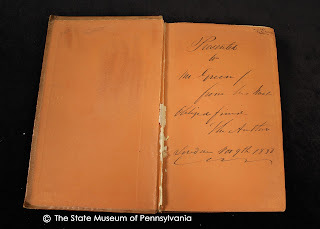 This is a firsthand account of the French nobleman’s observations and adventures traveling from Philadelphia through Pennsylvania, New York and beyond after being exiled from France for his involvement in the Insurrection of 10 August 1792 (a significant battle of the French Revolution). It is invaluable as an early account of the people and lands encountered, but it is also an artifact, and object of material culture held and treasured by many over the past 217 years. 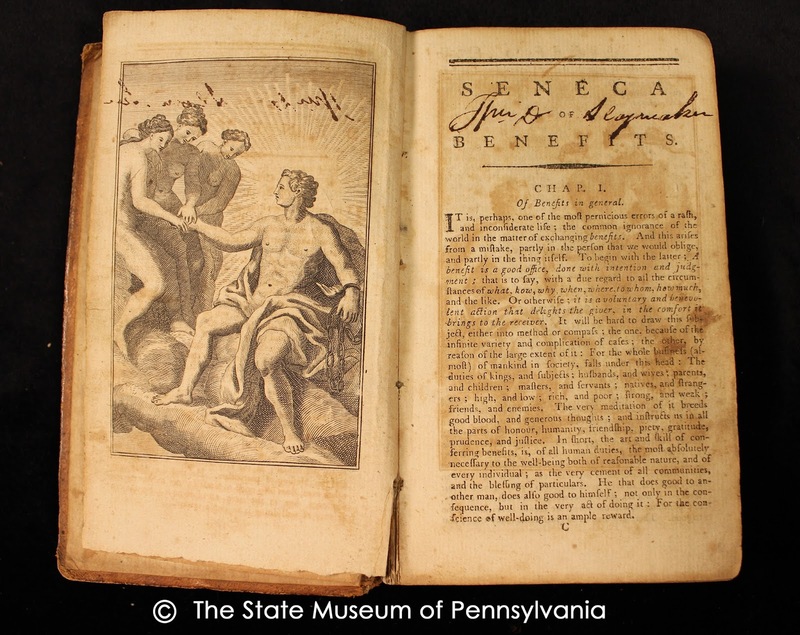 Another such treasure is a very old copy of Seneca's Morals of a Happy Life, Benefits, Anger and Clemancy written by the statesman and philosopher Lucius Annaeus Seneca and purportedly published in 1678. Again the importance of both the information retained in the text but also an example of early printing practices, paper and ink, a precious resource. 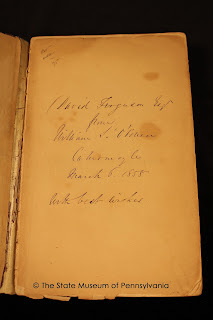 There are also a number of books bearing significant signatures. 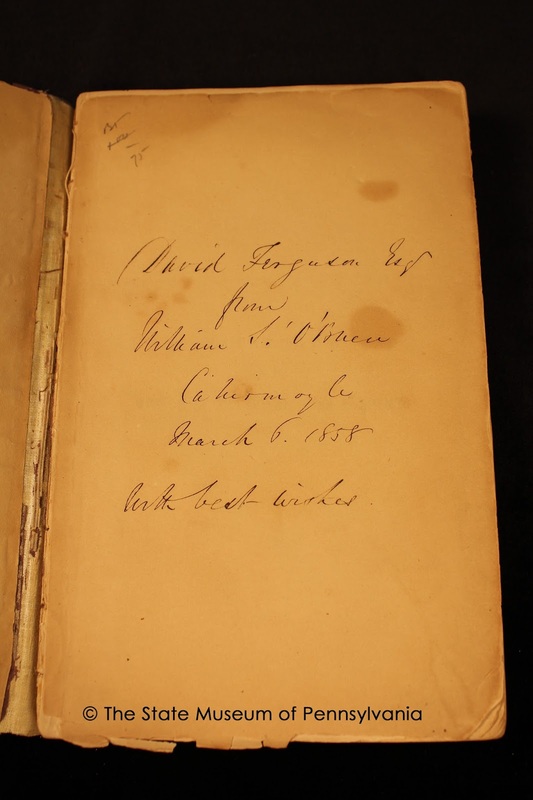 The Traditional History and Characteristic Sketches of the Ojibway Nation was written by George Copway and published in 1850.
simply signed “The Author”. 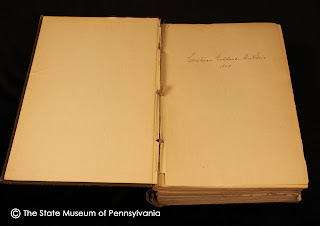 Another signed edition is in the 20th Annual Report of the Bureau of American Ethnology 1898-1899 signed by Constance Goddard DuBois (famous author and ethnographer) in 1904. She was a pioneer in the work of ethnography during anthropology’s infancy. 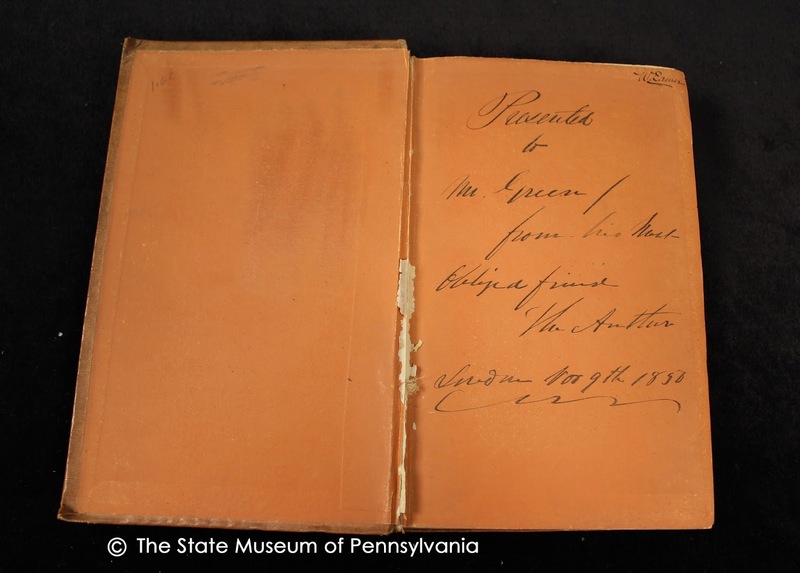 The last example of a signature discussed in this blog is the Catalogue of the Antiquities of Stone, Earthen and Vegetable Materials in the Museum of the Royal Irish Academy by W. R. Wilde, Secretary of Foreign Correspondence to the Academy and published in 1857. William S. O’Brien was an Irish Nationalist and descendent of the eleventh century Ard Ri (High King of Ireland). He was a founding member of the Ossianic Society, interested in promoting the Irish Language and is immortalized by a large statue in the middle of O’Connell Street in Dublin. Unfortunately, David Ferguson Esquire remains a bit of a mystery. 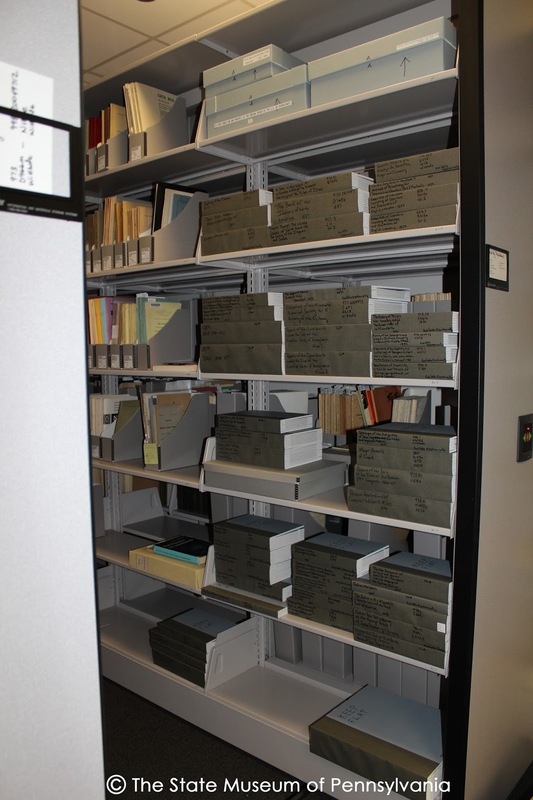 These are just a few examples of these wonderful resources in our library that are an essential tool for our archaeological and anthropological research. It is an ever growing collection as current archaeological journals are coming in, new books are purchased and donations are received. 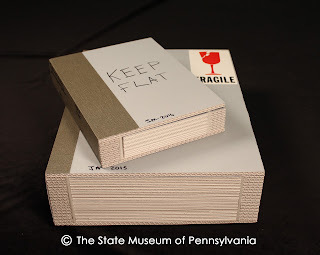 One such donation is from the personal library of a friend and colleague, Dr. Jeff Graybill. Among the more than 80 books graciously donated by his family was a copy of The McKenney-Hall Portrait Gallery of American Indians by James D. Horan and published in 1972. 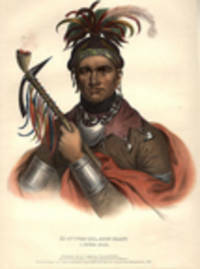 The McKenney-Hall portraits were commissioned by Thomas McKenney, Superintendent of the Indian Trade Bureau until 1822 when he became the head of the Bureau of Indian Affairs. It was in these capacities that he was able to meet with various Native Chiefs and dignitaries where they were painted by Charles Bird King. Fortunately, lithographs were made of these important and accurate depictions of various native groups because all of the originals were destroyed by a fire at the Smithsonian. The State Museum of Pennsylvania was able to acquire a nearly complete set of these lithographs in 1960 and now thanks to a generous donation, we have the book that explains their story and significance. 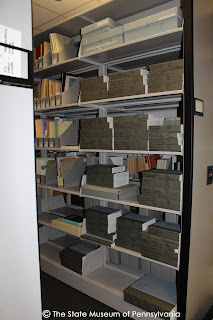 The library of the Section of Archaeology holds many treasures indeed… We hope you have enjoyed this glimpse inside our doors and the undertakings of this department. Our preservation efforts go beyond the material remains recovered during our archaeological investigations, they are only objects if we can not research and analyze them to complete the “picture” of our past. We hope we have inspired others to take a look in their own personal libraries or your local public library to enjoy these treasures from the past. Archaeology is to study past human societies through the excavation, identification and interpretation of their material remains. 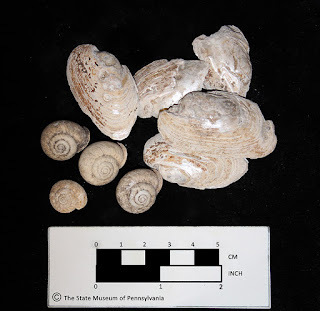 Differential preservation, especially in the temperate zones of the world such as Pennsylvania, yields but a glimpse of a society’s entire material culture. One approach by archaeologists has been to study the material remains that accumulated over days, months or years of occupation that have survived the vestiges of time. The remains of material culture typically lost, dropped or cast aside were often deposited on certain parts of the site and these are the objects that allow for a reconstruction of past cultural behavior. Archaeologists classify these locations as middens, places where stuff accumulated. Middens tend to develop inside of, or around dwellings, and at other locations on the site where tasks and crafting associated with daily activities took place. Waste such as butchered animal and fish parts, human excrement and rotting plants deemed purposeless were cast away and described as unsanitary. Their removal loosely discouraged the attraction of vermin, especially flies and at the same time served to prevent stench from permeating the immediate living area. Middens were also convenient repositories for broken and damaged tools as well as other objects used in the life of an individual. Cooking pots which were accidently dropped and broken and their contents lost, or occasionally overcooked and burnt, rendering their caloric value useless – over time all of this and more ended up in one of the accumulating garbage dumps. The preservation of these things over many centuries was principally due to the introduction of organics into an anaerobic environment. This, coupled with the change in soil chemistry from large amounts of discarded shells of river mussels, wood ash and charcoal enabled preservation of the midden. 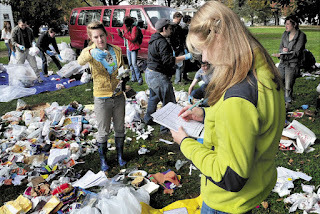 Much can be learned about humans and their activities through their garbage heap. 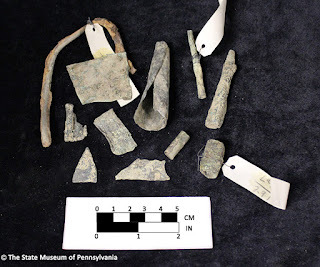 One example is the Eschelman site (36La12) midden associated with the Washington Boro Village site (36La8), a Susquehannock village of the AD. 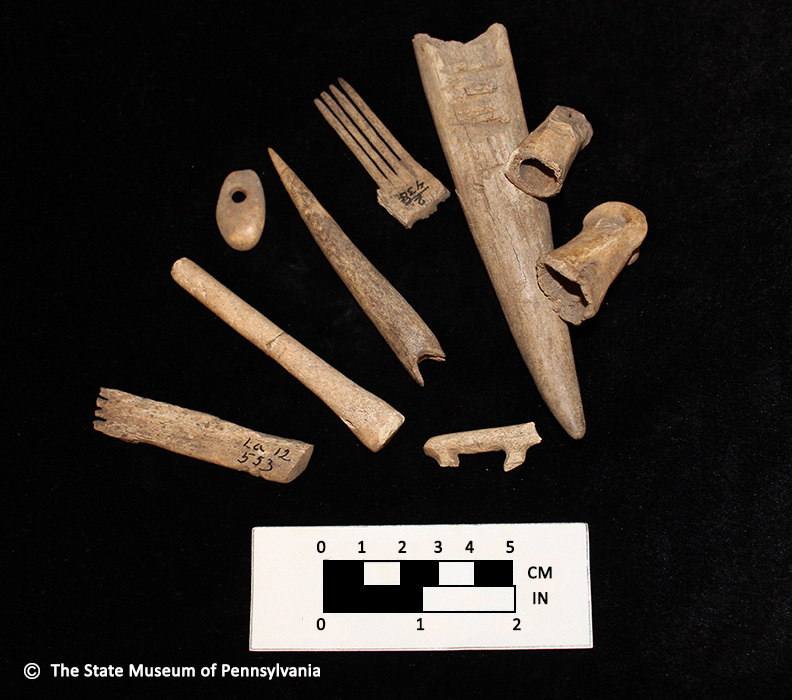 1600-1625/30 period, was excavated in 1949 by John Witthoft then with the Pennsylvania State Museum (now The State Museum of Pennsylvania). His excavations recovered a massive number of animal bones representing mammals, birds, fish, reptiles and amphibians. Among the bones were artifacts of broken pottery and stone tools and objects of European manufacture such as iron axes, awls and personal items of adornment – beads and bangles. Scraps of brass cuttings left over from making objects such as tinkling cones, facilitates preservation of some organics which would otherwise have decayed. 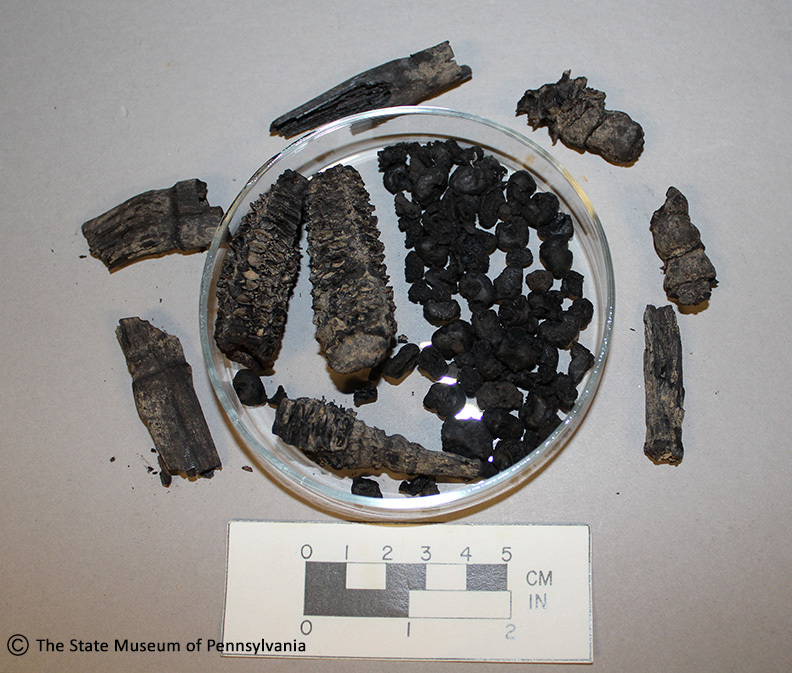 Eventually all of these things from the village longhouses and storage areas found their way into the Eschelman midden. By studying the bones, researchers were able to determine that certain butchering patterns were employed by the Susquehannocks when skinning, dismembering and processing carcasses for hides and food. Other cut marks indicate that extreme care was taken to carefully remove the pelt for later use in the tailoring of leather clothing and blankets. 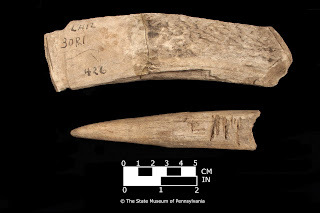 The proximal and distal ends of other bones displayed severe cut marks where the Susquehannocks chose to make their incisions so as to effectively remove the meat. Many bones of the larger animals, principally elk, deer and bear were smashed and broken apart for extraction of the nutritious marrow they held. A more telling example of how middens reveal something about the message of 20th century consumerism is William Rathje’s Tucson Garbage Project. This study pioneered the creative field of research known as “Garbology”. 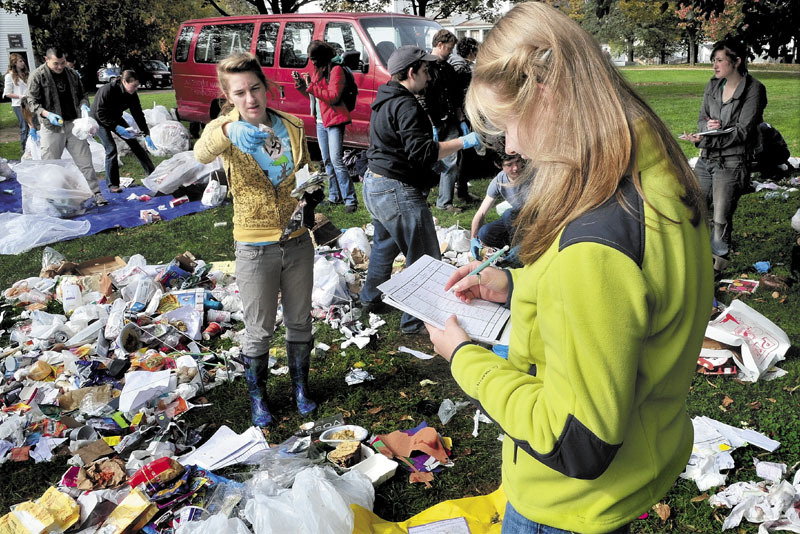 In 1973 Dr. Rathje and his students at the University of Arizona began this study by sorting waste at Tucson’s landfill. The upshot of their findings demonstrated that residents sent 10% of their food to the landfill and that the poor and wealthy households wasted surprisingly less than middle class households – a lesson to be learned in today’s sustainability of food production and consumption. We hope you will take some time to read about the archaeological heritage of our commonwealth and the lessons that archaeology can provide for the future. Please take the time to record archaeological sites that you may know about. Remember this is your heritage and it is our duty as citizens to strive to preserve the past for the future.